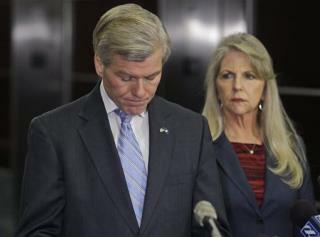 (Newser) – Before the indictment came down against Bob and Maureen McDonnell, Maureen told prosecutors that she felt solely responsible for striking up the couple's scandalous relationship with Star Scientific, and asked prosecutors if they could let Bob off the hook, sources tell the Washington Post. But prosecutors showed no interest in the deal, instead later countering with one that would see Bob take the fall, pleading guilty to a felony fraud charge entirely unrelated to the corruption allegations and letting Maureen walk. The governor rejected the offer. Should we file this under family values, or personal responsibility? Before the indictment came down against Republican Bob and Republican Maureen McDonnell, Republican Maureen told prosecutors that she felt solely responsible for striking up the Republican couple's scandalous relationship with Republican Star Scientific, and asked prosecutors if they could let Republican Bob off the hook, sources tell the Washington Post. I thought political leaders including governors can't take gifts from anyone for any reason. Guess I am wrong uh. I'll bet he did not report it to the IRS either. Ah, Judas Priest,if the wife asked for the gifts, and that wasn't illegal, then where does the prosecution's case go? down the tubes, most likely and so does the taxpayer money for the trial.